The Traveling Science Demonstration Program, a partnership between the University of South Carolina-Aiken's Ruth Patrick Science Education Center (RPSEC) and SRS, provides scientsists and engineers who are experts in their fields to teach in the areas of chemistry, biology and physics. 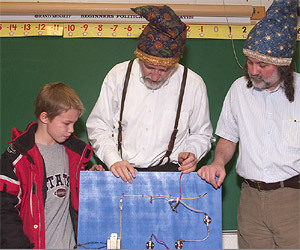 SRS volunteers conduct demonstrations and experiments for teachers and students using science kits accessible by loan to each of the schools. The program involves students with world-class scientists and enhances teachers' abilities to provide hands-on math and science equipment not available in most schools. 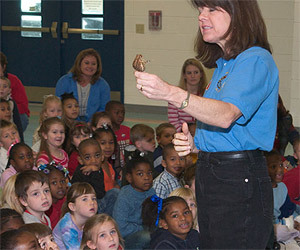 Visits are scheduled by contacting the Ruth Patrick Science Education Center. This program is for CSRA elementary, middle and high school students. In honor of DiscoverE National Engineers Week, SRS engineers, scientists and technicians make classroom visits to the CSRA middle schools conducting hands-on scientific demonstrations to encourage students to pursue technically oriented careers.The schedule below will be updated weekly during the program roll out. The event is scheduled for Feb 20-March 6. The deadline for submittal of request is Feb 10. For questions or additional information contact Gladys Moore at gladys.moore@srs.gov or 803.952.9450. 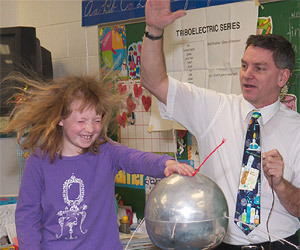 • Click here to access the Ruth Patrick Science Education Center Traveling Science Demonstrations web page. Contact: Gladys Moore, Education Outreach Programs, (803) 952-9450.